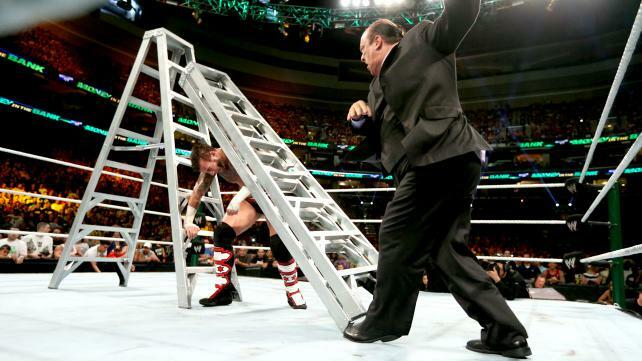 Money in the Bank was an excellent event that pulled out all the stops and produced a great moment when Paul Heyman blindsided CM Punk with a ladder and cost him the MITB briefcase. These moments are normally reserved for Monday Night Raw. It’s not hard to understand why, considering that more people will always watch free Raw than a pay-per-view. Still, I would have bet any amount of money that the turn would have happened on Raw and build to a Brock Lesnar vs. CM Punk match at Summer Slam. Royal Rumble 1994: Owen Hart blames older brother Bret Hart for losing their tag team title match, kicks him in his injured and leaves him in the ring while calling him selfish. This led to one of the WWE’s historic feuds and produced some absolutely stellar matches included their classic at WrestleMania 10 and their infamous steel cage showdown at Summer Slam of that year. Summer Slam 1994: I saw this coming a mile away, but that didn’t stop me from enjoying the moment when Tatanka turned on Lex Luger and joined Ted DiBiase’s Million Dollar Corporation. We had been led to believe that it was Luger who sold out. Tatanka was getting stale after his undefeated streak ended, so a fresh coat of paint was just what the doctor ordered. Halloween Havoc 1995: This time, it was Lex Luger who turned heel when he joined the Dungeon of Doom as he led Randy Savage into a trap. This culminated with Hulk Hogan and Macho Man receiving a massive beat down from Luger, Kevin Sullivan, The Giant and, The Yeti. Bash at the Beach 1996: Who will ever forget the night when the wrestling world was turned upside down? Hulk Hogan was revealed as the infamous third man, turned heel, and formed the nWo with Scott Hall and Kevin Nash. Living Dangerously 1998: Al Snow was revealed as Lance Storm’s mystery partner against the Triple Threat after Sunny, Storm’s pseudo mystery partner, turned on him. The Asbury Park Convention Center turned into a rave as the audience became engulfed with styrofoam heads. Living Dangerously 1998: One of the great visual moments in ECW history occurred when Bam Bam Bigelow literally planted Taz through the ring to break the Tazmission and win the TV title. Heyman had fans convinced that Taz was a legit shooter, so the idea that it would take something so drastic to beat him was believable. Slamboree 1998: This one may be my favorite. Rey Mysterio eliminated himself by making Ciclope the unlikely winner of the battle royal to earn a shot at Chris Jericho’s cruiserweight title. Ciclope begins to inexplicably unmask and reveals himself to be Dean Malenko. This garnered a massive pop from the Worcester Centrum crowd as Malenko defeated Jericho to win the title. WrestleMania 15: Now this is one I never saw coming. Triple H double-crossed X-Pac, helps Shane McMahon retain the European title and leaves D-Generation X for Vince McMahon’s Corporation. DX was so popular in 1999, but the company went a different route as this was the beginning of Hunter’s main event push. Anarchy Rulz 1999: The word was out. Taz had signed with WWF. The ECW faithful spewed chants of “You Sold Out” towards the human suplex machine as his scheduled match with Masato Tanaka turned into an impromptu Three Way Dance involving Mike Awesome. Shockingly, Taz was pinned in just over two minutes by Awesome and Tanaka. The entire roster cleared the locker room to put over gravity of the situation and looked on as Mike Awesome became the new ECW champion and star for the company. Invasion 2001: Stone Cold Steve turns on team WWF, which allows team WCW/ECW the pick up the win and joined their ranks. This was shocking at the time because the invasion angle still had legs at the time and no one saw Austin, who has such strong WWE colors, working with WCW. Those are my picks. Feel free to comment on some of your favorite PPV moments.